Our Maxi Mine Explorer trip takes you into parts of the mine, hand-dug and worked by Victorian miners in 1836 and areas worked up until the 1970s when the mine was abandoned. As the door creaked shut for the very last time a virtual time capsule was left behind which you can now explore. After years of research, our experienced Mine Guide will share stories of mining life as you explore the underground with some climbing and scrambling if you wish (these parts of the trip are optional). All of our trips run with a small group of explorers which means that we can largely tailor make them to suit your wishes, interests and abilities and those of the other members of your group. With 2 hours underground, you'll discover old mining tools, machinery, drinking vessels, candles and cigarette packs discarded by the miners whilst stories of life in the mine spill out in such a way you can almost feel it creaking back to life. 100% authentic, adventurous and fun. Kit provided: Helmet, cap lamp, lamp belt & safety clips. Walking distance: 1/2 mile. Please allow extra travelling time for your journey due to forestry work taking place nearby. Please ignore the diversion signs as the A487 road between Machynlleth and Dolgellau is open. It will close Intermittently for 10 minute intervals just south of Corris and then reopen allowing traffic to pass. The T&Cs below include really important information about your trip including what to wear and to bring with you etc. Please read them carefully before accepting them. If you're booking for 6 or more please phone us on 01654 761244 to book your trip. 1.Visitors must not suffer from claustrophobia. 2.Visitors should have good eyesight (aided by glasses where necessary). 3.Visitors must be physically and mentally well. Visitors must bring to the attention of the guide any medical conditions such as asthma and epilepsy which may potentially affect their visit. Please bring your medication with you i.e. inhalers, insulin. 4.Visitors should inform the Guide if they have any conditions that may affect their exploration i.e. pregnancy, slight deafness. Please phone us, if you’re unsure of anything, before you make your booking. 5.The temperature underground is a cool 8 degrees, you may get a little dirty and may have to walk through ankle-deep water. Please wrap up warm and wear 2 pairs of thick socks with wellies / walking boots. Wellies can be provided if necessary. 6.Please arrive on site and report to the Corris Mine Explorers reception at least 15 minutes before your Underground Trip departure time. 7.Photography is allowed underground but at the discretion of the guide. Bulky photographic equipment and Go Pros must not be used underground. Any filming underground is restricted. 8.There are no toilet facilities underground. Please make sure that you use the toilet facilities at the Craft Centre prior to departure. In an emergency underground, please consult the guide. 9.Visitors must not be under the influence of alcohol or other substance with may alter or impair their mental or physical condition other than prescribed drugs in the correct dosage which are known not to have any side effects which may affect ability. 10.If you’re booking for 6 people or more we can tailor make a trip especially for you. Please telephone us and tell us what sort of trip you would like, be it adventurous, historic or something a bit more extreme and we will tailor make an underground adventure for you. 11.For groups of 10 people or more, please contact us by phone or email to discuss and arrange a tailor made trip especially for you (as in 10. above). Groups of 10+ receive a discount with 1 person exploring free with every 10 people booked. 12.Where a booking is made over the phone, full payment must be made to confirm your booking. 13.There may be occasions where your exploration time and date may change. We will contact you in advance to discuss and arrange this. 14.In certain circumstances we may need to merge 2 trips of varying lengths together. This will be done in such a way as not to affect your experience underground. If you’ve booked a shorter trip and wish to upgrade to a longer trip, this can be done on the spot if so wished. 15.Should we have to cancel a trip for any reason we will contact you as soon as possible to either rearrange your trip or to provide you with a full refund. 16.If you need to cancel your booking for any reason and we are able to re-sell your tickets for the trip booked then we will provide you with a full refund. At the Manager’s discretion, if we are not able to re-sell your tickets, then no refund will be provided. 17.Anything taken underground must be in a backpack (30 litre max) or safely in pockets. No bags can be carried as both hands must be free at all times. It is recommended that valuable items are not carried underground but left in a safe place on the surface (e.g. car keys, wallets, mobile phones, etc). 18.The visit guide is in charge of the trip and the guide’s instructions must be followed at all times. 19.We reserve the right to refuse admission to anyone without having to provide an explanation. 20. No dogs are allowed underground. 1.There is a minimum age limit of 10 where the child is accompanied by its parent or other responsible adult; otherwise the lower age limit is 18. 2.There is no maximum age but visitors must be able to meet the capability requirements detailed above. 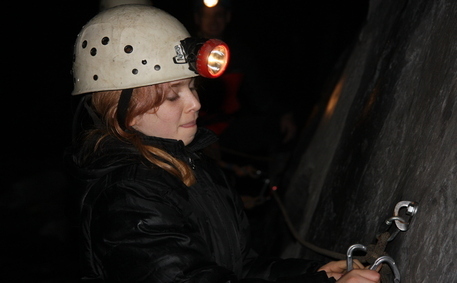 3.The trip will include walking upright, ducking in places (the tunnels are approximately 2m high and 2m wide but vary), clipping onto safety ropes to traverse ledges, the option to crawl through holes and to scramble around is also available but optional. 4.Before approaching exposed edges and climbing (optional activity), visitors must clip on to the safety rope provided before reaching the hazard and must not unclip until the end of the rope beyond the hazard. The Guides’ instructions must be followed at all times. 5.Visitors must be fit and agile and capable of walking ½ mile at a steady pace and climbing a sloping path and climbing 3 steps up to the mine entrance. 6.Visitors must make use of the equipment provided at all times. This equipment will include a helmet, cap lamp, battery belt and safety clips. 7.Visitors should not bring their own lamps. 8.Due to the length of time underground, you are recommended to wear an extra layer as well as a coat. 9.Instructions in the use of the safety equipment and in safety procedures will be given at the start of the visit. Visitors must pay careful attention to all these instructions.